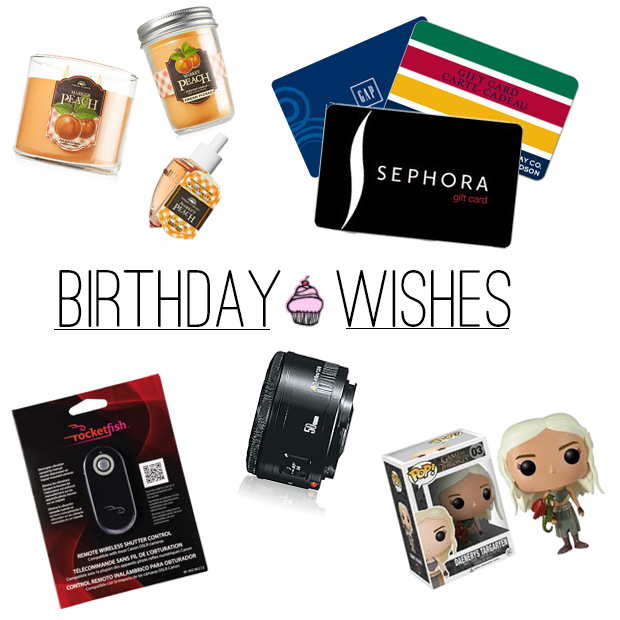 The Birthday Wish List – amandarobots. My mom seems to have found my Christmas Wish List interesting and helpful, and she asked if I’d do a birthday version. So here we are. – Bath and Body Works’ Market Peach range is the stuff of legend in the beauty blogger community. This year, they came out with not only the three-wick candle, but the matching mason jar candle, wallflower bulb, lip balm, lip butter, body cream, and hand soap. I only bought a candle the last time I was in, buuuut it’s almost half done because I love it. I’m moving soon and want my new room to smell amazing all the time. Market Peach 5eva. – Gift cards to my favourite stores, because I am super boring. I will likely be needing a few t-shirts and dresses this summer. Last summer I stocked up on shorts, so I’m good for those assuming they still fit. My favourite t-shirts come from The Gap, and you can get some surprisingly cute stuff if you’re patient enough to scour the young-people-section of The Bay. Sephora is amazing and fun and my favourite ever – plus I’ll be needing some new skincare bits soonish. Need I say more? – I was in Chapters a little while ago and they had a Game of Thrones display, which included this cute bobblehead figurine of Daenerys Targaryen. She’s my favourite ASOIAF/GOT character, and I think she’d be cute on my desk. – Since starting this blog and actually kind of learning how my DSLR works, I’ve been getting into photography. I’d like to try out a camera lens that blurs backgrounds in photos and videos and such (because I may or may not have YouTube aspirations…). The Canon EF 50mm f/1.8 lens seems like a reasonably priced way to do that! – Finally, another photography item – a remote. Sometimes, when I’m taking blog pictures of myself applying things like here, it’s a little tricky to time and frame things right with the timer. A remote like the Rocketfish Remote Wireless Shutter Control would let me snap the photo with one hand while applying products with the other. And that is it! I know it might seem odd that there are no makeup products on my list, but I picked up quite a few of the things I wanted in the Sephora sale a few weeks ago – so I genuinely can’t think of anything on my list! *Note: none of the photos in this post are mine. Click links in the description to view the source!